Have you ever heard of skin hunger? This phrase came up during a presentation by Dr. Melita Belgrave, a fellow music therapist, at a recent meeting of the Kansas City Partnership for Caregivers. We have an innate need for physical contact with other human beings, and “skin hunger” refers to the problem we have when we don’t get enough. It’s a rather stark phrase that describes the problem exactly, and it’s an especially significant problem for older adults. Just a few minutes ago, I put my baby daughter to bed. She has a cold, and she was having a hard time falling asleep on her own, so I rocked her to sleep, stroking her hair and humming quietly. When Alice was first born, we held and rocked and cuddled her constantly. As research dating back to 1959 and Harry Harlow’s infant monkeys has shown, babies need physical touch for healthy development. I don’t know of anyone who would deny this these days. That need for touch continues for adults, but many people wouldn’t identify that as a major issue for themselves. Most of us have little problem getting the touch we need, whether from cuddles and hugs with our families, pats on the back from our co-workers, or simple handshakes with business acquaintances. Sure, we get a sense of what it’s like to long for another’s touch when our kids leave home or our spouses are away, but most of the time, we probably get the physical human contact we need. This physical touch can be more difficult to come by in one’s later years. Your spouse dies, and your kids and grandkids live too far away for the frequent hugs and kisses you used to get from your loved ones. If you’re living at home, you just might not be around other people all that much. If you live in a nursing home or other senior living facility, the people caring for you are employees – professional caregivers – and they might feel uncomfortable giving hugs to the residents or perceive affectionate touch as somehow undignified for the resident. (Not to mention that some facilities might be afraid of litigation for inappropriate relationships.) On top of that, you might be in a wheelchair or behind a walker or otherwise less accessible to folks, or you might be in pain when people touch you or bruise easily or have wounds on your skin or look “scary” or “gross” to those kids visiting from the preschool or…. the list goes on. Simple, affectionate touch is harder to receive. Even family members can shy away from hugging or kissing a family member who looks so much weaker or sicker than they did in years past. Whether it’s distaste for the person’s condition or fear of harming the other person or just the awkwardness of hugging your father-in-law, the older person isn’t getting the physical contact they need. This is skin hunger. As people in eldercare learn about this problem, more and more professionals are making concerted efforts to give affectionate touch the people they work with. Still, it can feel awkward or unprofessional or out-of-the-ordinary. What to do? My solution is to facilitate music experiences that encourage touch. I do this in three ways, all of which are ideas that anyone can use, whether you’re a music therapist or not. Dance together. All you have to do is stand up and move to the beat. Or, remain seated, hold your older person’s hand, and sway in time to the music. Or, gently pat his knee to the beat. All of these provide touch, and you can be very gentle. Provide hand-over-hand assistance with playing an instrument with recorded music, being sure not to cause pain or move someone else’s hands or arms in an unnatural way. Besides these methods, I ALWAYS great people by shaking their hand, giving them a hug (at their request), or gently patting their knee or shoulder, or even smoothing back the hair from their forehead when they don’t have sensation or have pain below the neck and shoulders. Honestly, I don’t know how to greet an older adult any other way. 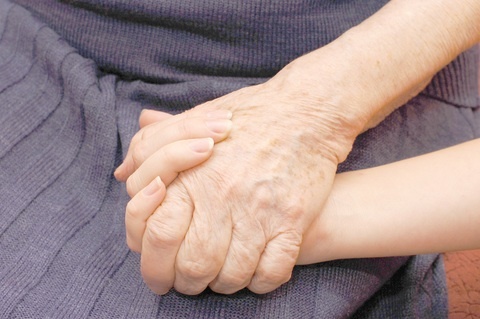 Cultivate an awareness of your older person’s aches and pains. Watch for non-verbal communication of discomfort or pain. Ask the older person if the touch you are providing is okay. Err on the side of gentleness. Be aware of avoiding wounds and skin tears. Use good personal hygiene and hand-washing to prevent the spread of infection. Touch is something that people need, and there are plenty of ways to provide touch that aren’t inappropriate or icky or painful. Music can help facilitate that and help to overcome the awkwardness of interacting in a new way. Hugs and gentle touch are so important. I find many living in long term care settings are hungry for touch. Hand massages, manicures, holding a person’s hand while you visit in addition to all these wonderful idea you’ve shared can help. Yes, hand massages, manicures and holding a person’s hand – these seem so simple but can make a huge difference. When I left for college, I went out of state and I didn’t know a soul at theschool. I remember aching for touch. I realized that I would go days and days without touching someone and it was weird. I took for granted my opportunity of getting hugs, backrubs, pats on the back and squeezes from the large family I grew up in. I wouldn’t have even considered that I grew up in a touchy-feely family but when you are familiar with someone you do touch a lot. When I work with older adults I go out of my comfort zone and I make an effort to touch and hug them more that I would normally do (again, did not grow up in super-huggy family so it’s a little foreign). Because I am a woman I guess I have assumed I could get away with it a little more without people raising eyebrows or me feeling paranoid that such gestures are inappropriate. I have always thought it’s better to ere on the side of showing love to people who often feel isolated or crave attention. Even if you gently cup your hand over theirs while it rests on their lap, or put your hand on their back, all of that communicates warmth and friendly affection. I remember watching a tape of that study you referenced where the baby monkey’s have phsyical touch from their mother’s witheld and it is the most heartbreaking study I have ever seen. Our bodies and spirits are hardwired to crave phsyical connections with others. Yes, it sounds like you know exactly what skin hunger feels like, and now that you bring it up, I remember having a similar experience when I moved away to college. It just shows how important it is to give and receive physical affection, even in simple ways. Thank you, Janea! When I worked in nursing homes, I nearly always had some physical contact with my patients. A touch on the hand or the shoulder just seemed like the natural thing to do–even though psychologists get pretty strict training about avoiding physical contact. I had to trust my instincts. It would have felt uncaring to avoid those types of touch, and being uncaring felt more unethical than reaching out to hold a hand. I’m glad to hear of others who provide caring touch as well! Thanks for your comment, Ann. Music therapists are trained to be cautious about touch as well, particularly in mental health treatment settings, but as you said, it feels uncaring to provide even that simple interaction of holding a hand. I’m glad there is a growing body of evidence to show that touch is not just okay, it’s necessary. Hi Rachelle, I well remember when my mother was in a nursing home that she really appreciated holding hands or a peck on the cheek. I think of that now when I see elders in wheelchairs. It does make them less accessible. Thanks for writing about this. Thanks, Carolyn. It’s a good reminder that we all need to give and receive touch, especially with barriers like wheelchairs.